This is one of three similar designs around the edge of this octagonal plate. This print shows a fence to the left and landscape, hills, trees and another fence to the right. It is printed in deep purple and the source is not known. 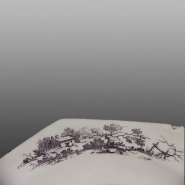 Two versions of L'Amour are found on Bow porcelain, this is the more frequently encountered. It is printed in dark purple and shows a woman holding a fan in her right hand with her lover kissing her hand. To the left is an urn on a pedestal with trees in the background and to the right is a figure of Neptune with four horses, which seems to be a fountain in a pond. In the foreground is a garden roller and grasses. Sherds of this design were found on the Bow site. The source is a print in A Book of Small Figures from the Originals of Cochin Junr. This was published and sold by F. Vivares and consisted of seven pages, four of them engraved by W. Elliott. For the source print see English Ceramic Circle publication of Bow Porcelain - On-glaze Prints and their Sources, Gordon and Sue Guy-Jones. This scene is surrounded by three small prints of cottages in rural settings.